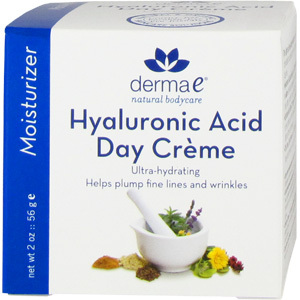 Hyaluronic Acid, a naturally occurring substance in the body, is one of the most effective moisturizing agents available, holding up to 1000 times it weight in water. 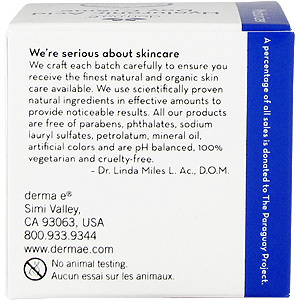 Its unmatched hydrating properties plump and smooth, resulting in firmer, more youthful skin. This luxurious formula has blended Hyaluronic Acid with Ester-C, Aloe Vera, Green Tea, and Vitamins E and A into a light, moisturizing creme that visibly reduces the appearance of fine lines and rehydrates for firmer, more resilient skin. Your skin will be protected from oxidation (aging), sun and environmental damage, and younger-looking, vibrant and healthy. 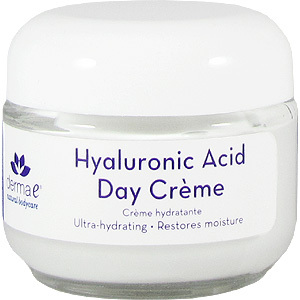 Hyaluronic Acid Day Creme Rehydrating formula plumps skin to visibly reduce the appearance of fine lines and wrinkles, for soother, healthier-looking skin. Especially formulated for day use. After thoroughly cleansing your skin, apply Derma e Hyaluronic Acid Day Creme in the morning and afternoon. May be used under make-up. Purified Water, Aloe Vera Gel, Green Tea Extract Glycerin, Witch Hazel Extract, Caprylic Triglyceride, Stearic Acid, Cetyl Alcohol, Glyceryl Stearate SE Ceteareth 20, Jojoba Oil, Hyaluronic Acid (Actimoist Bio-2 Ester-C, Tocopheryl Acetate (Vitamin E), Retinyl Palmitate (Vitamin A), Polysorbate 20, Dimethicone, TEA, Titanium Dioxide, Methylparaben, Ethylparaben,I.Urea, Plumeria Oil. 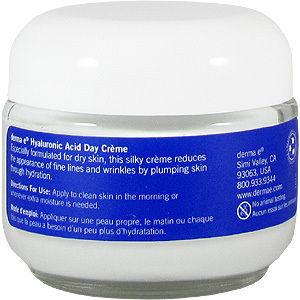 Hyaluronic Acid Day Crème Rehydrating Formula is shipped in a discrete, unmarked package. Orders are processed immediately and usually take about 3 to 5 working days to be received. We do ask that you try it for 2 to 3 weeks to feel the full effects. Any information received is used only for order processing and shipping purposes. Your information, such as e-mail address, will never be disclosed to a third party.